Why Should Website Localization Be Your First Step To Going Global? Why Should Website Localization Be Your First Step Towards Going Global? The idea of taking your business global always comes along with two diametrically opposite emotions – a sense of elation on one hand, and nervousness on the other. The sheer excitement that comes from pushing your business to conquer new frontiers is natural – your business is growing fast and scaling new heights. Anxiety, too, is expected along this journey, as you are getting out of your tried-and-tested comfort zone and exploring unknown territory. A lot of times the joy remains short-lived as it gets overshadowed by niggling apprehensions, and the exhaustive planning that is required to ensure your company’s entry into a foreign market should not be underestimated. Opening a plush local office, hiring an efficient team of employees, spending massive sums of money to build your brand identity locally, etc. – these are just some of the worries that you would have to deal with while taking your business to new places. There is no denying the fact that all of them are significant ways to ensure you make a grand entry into the markets and regions you intend to explore. But you also need to be wary of going ahead with these moves as they involve a lot of risks. Many businesses often make the mistake of taking hurried and unnecessarily expensive steps in their bid to make a mark in the new geography. Such risks can result in heavy losses in terms of time, money and energy. The smartest way out in such a tricky situation is to try out something that is relatively risk-free – like ‘website localization’ (which means fine-tuning the content and look of a website to suit the sensibilities of a certain population where a business is trying to seek a foothold). In this blog, I am sharing with you 3 compelling reasons why website localization should be your first and foremost move – not flashy offices, complex operations and heavy investments. Let us admit it. Your fears of going global are genuine and understandable. You are not sure as to how this step would turn out for your business. Whether you will make a good return on your investment or whether the new move will be a big flop, there is no way of telling beforehand. In such a scenario, what could be the most practical solution for eliminating this dilemma? Well, if the risk factor associated with your venture’s big leap gets reduced, most of your worries should go away as well. This is exactly what website localization does for your business. It gives you the opportunity to test the waters without letting you make hefty and risky investments. Localization transforms your website so that it acts as a small and smart offshore office without making you invest in an actual infrastructure. By localizing your website, you can get a peek into what your customers are appreciating and what they think is un appealing about your business. It literally acts like a crystal ball in which you gaze into, and get a clear picture of what’s coming up. With a successfully localized website, you can repeatedly test things and figure out whether the coast is absolutely clear for you to make a move physically – or whether the new place or market that you are targeting is a safe bet for your expanding business. The bottom line is, website localization will help you save a lot of money on unnecessary investments. Speaking the same language and representing the same ethos are necessary to build a strong, trustworthy relationship with your clients, prospective customers and new stakeholders. By tailoring your website according to the sensibilities of your customers in the targeted region, you not only convey yourself in a better way, but also help them connect with you with easily. Your physical presence, without you making an effort to blend in within the region, will make you stand out as a foreigner, which in most of the cases will be hard for the local people to associate with. Interestingly, empirical evidence reveals that 46 percent of buyers never purchase products or services if the language is foreign to them. Besides, more than 50 percent of buyers believe that browsing in their own language is much more important than the price of the products and services on offer. This makes a compelling case that website localization is inevitable if you want to build credibility in the eyes of your new customers. Studies reveal that more than 93 percent of all online activities begin with an online search. The first thing that consumers do, when faced with a decision, is to search it on the internet to get an understanding of whether it is worth the investment. This means search engines should be your primary target area, where you can find users and convert them into customers. Website localization offers you a whole new arsenal of keywords in the regional language. If you are not localizing your site, chances are that you will fare badly in the internet search results, because you will end up not offering what the customers in the target region are searching for. For example, let’s say you sell corn. Now, if you use the same word when selling in the UK, probably you won’t get any buyers. Why? Because in the UK, no one calls it ‘corn’. British people use the word ‘maize’. One wrong use of a word can take your ratings down and affect the expansion plans of your business. Website localization is fast proving itself to be a game-changer for global businesses that are jostling with each other to break into newer markets. Besides saving money in the initial set-up phase, it allows you to tailor-make your products and services based on the feedback from your customer base to be. The business potential of localizing your website is huge. Make sure you do not miss out on this crucial ingredient of success for your fast-growing business. 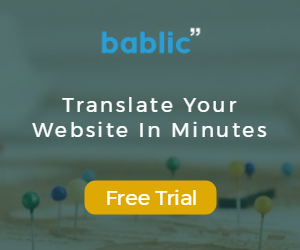 Bablic is one of the simplest and fastest ways to localize your website in all major languages. Try us out to take your business to the next level with ease.